When people tell you that the little things in life matter the most, they are probably talking about the Small Plush Longhorn Bull Lil' Buddies by Fiesta! It is a scientific fact that people who carry a longhorn bull stuffed animal in their pocket are fifty times more likely to have a smile on their face than those who don't. Just to clarify, when we say a scientific fact, we mean we made it up. It's more of a hypothesis at this point in time. As soon as our funding comes through we are going to do the actual research but for now we just make bold and assertive claims that this small stuffed longhorn bull can make people smile. It has been our experience though. If a cute plush longhorn bull doesn't make you smile then there is definitely something wrong with the pleasure center in your brain. Misfiring synapses, most likely. Again, just a hypothesis but you should really get that checked out. 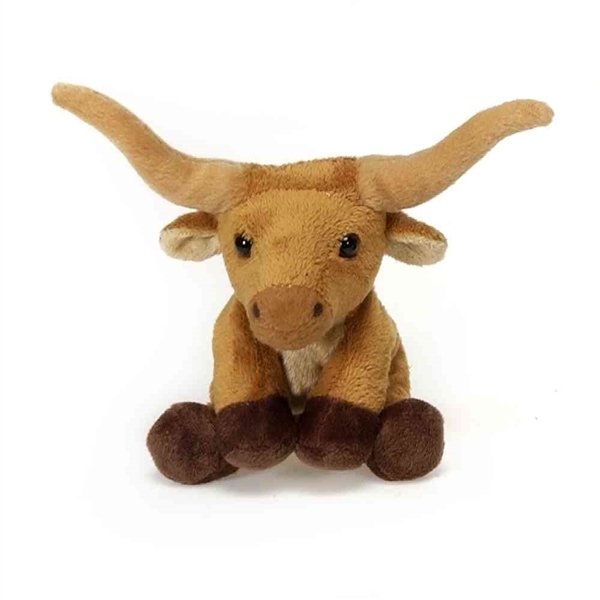 If you're nervous about the trip to the doctor, take this small longhorn bull stuffed animal with you. Your misfiring synapses might not let you smile on the outside but having the Lil' Buddies small plush longhorn bull in your pocket will, at the very least, make you feel good on the inside. That is a small victory but a victory nonetheless. It is the little things that matter the most, after all! For over 40 years, Fiesta Toy has been one of the world leaders and innovators in stuffed animals and plush toys. Their wide assortment of traditional and unique stuffed animals inspires creativity and imaginative play. Fantastic products like this stuffed longhorn bull allow children to share in the magic of the animal kingdom and learn more about the fascinating creatures that inhabit and share our planet. The Small Plush Longhorn Bull Lil' Buddies by Fiesta is made with all new, child safe materials and meets or exceeds all U.S. safety standards. Recommended for ages three and up, we suggest surface washing for this small longhorn bull stuffed animal.